That’s it. The small objects can be anything. 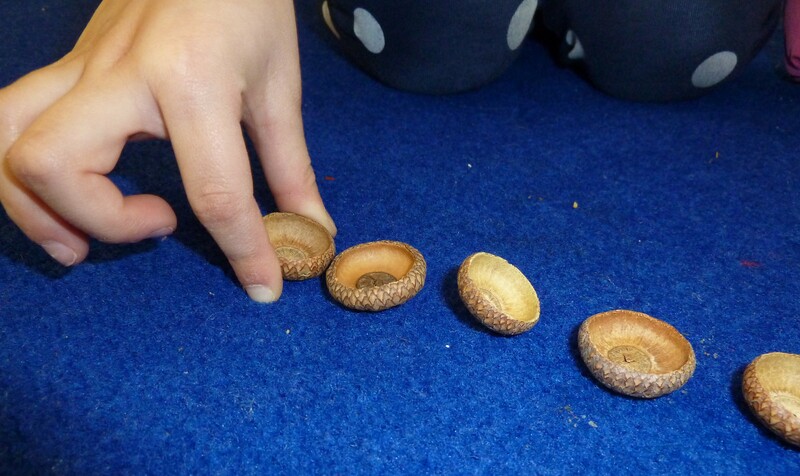 We used acorn caps, bottle caps, counting bears, buttons, baubles, rocks, and markers. You could use sugar packets, toothpicks, pine cones, or what ever else you have on hand. The number of objects can also be varied if necessary. If you decide to do any research regarding this game, you’ll find that there are as many ways to play it as there are cultures on the Earth. We decided to start with a line version using 20 small objects. Place all of your small objects in a straight line. Take turns collecting pieces from the line. You may pick up 1, 2, or 3 objects. The other person takes a turn and may pick up 1,2, or 3. The person who picks up the last piece loses. The point of this game is to eventually develop a strategy that will ensure that you will not end up with the last object. However, much like playing tic-tac-toe with four and five-year olds, you might not see much forward thinking at this point. Don’t worry about spending lots of time talking about how to make a strategy and how to win. Instead, simply play, have fun and occasionally verbalize your own thinking before you make a play. It will take lots of practice before the children will begin to plan future moves. The good news is that this kind of practice is much more playful than “drillful” and can be played with practically any materials on hand.